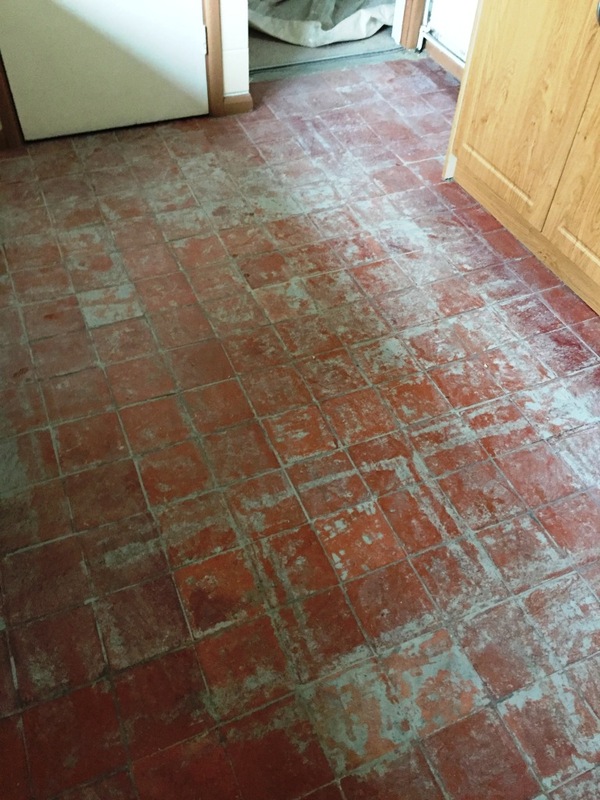 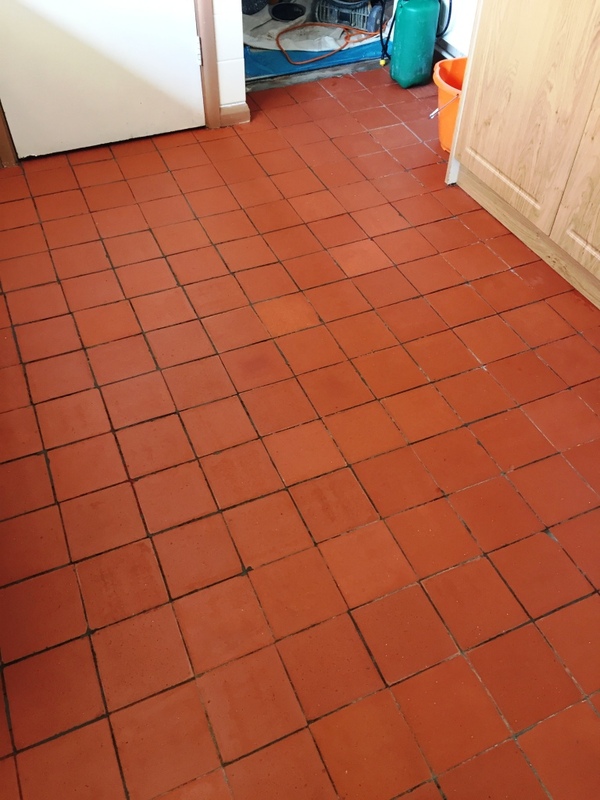 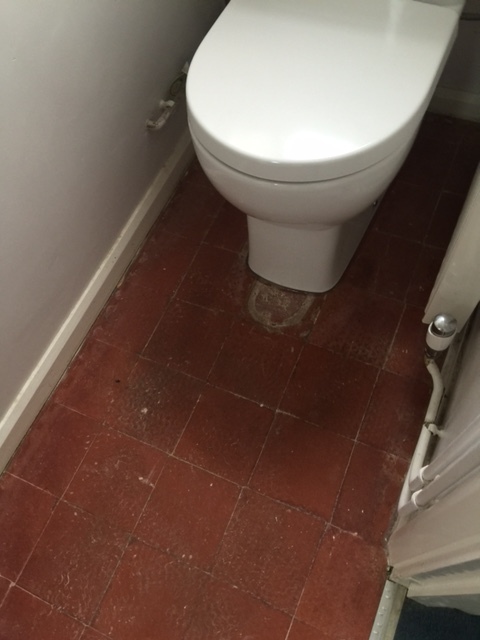 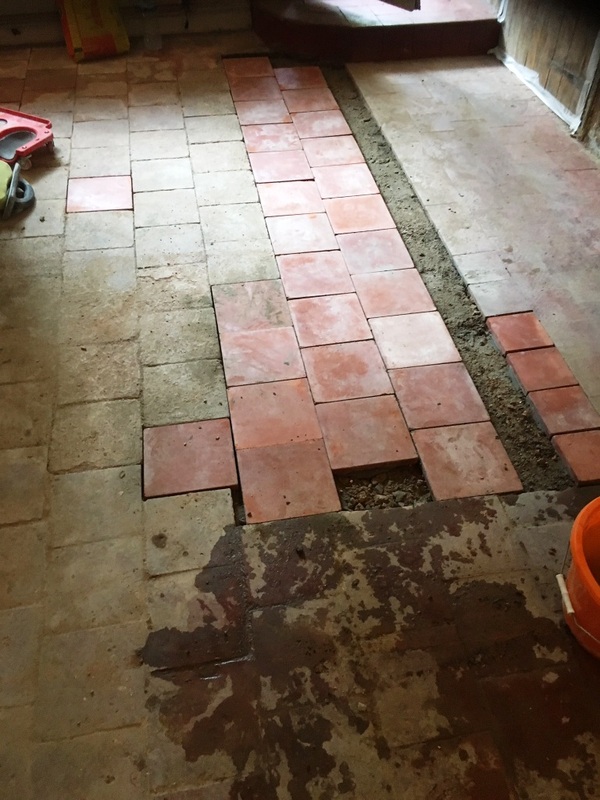 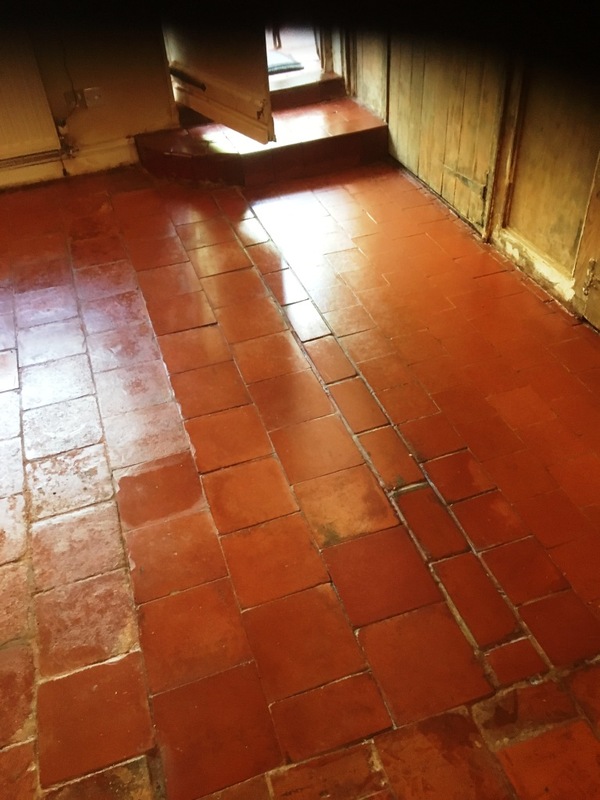 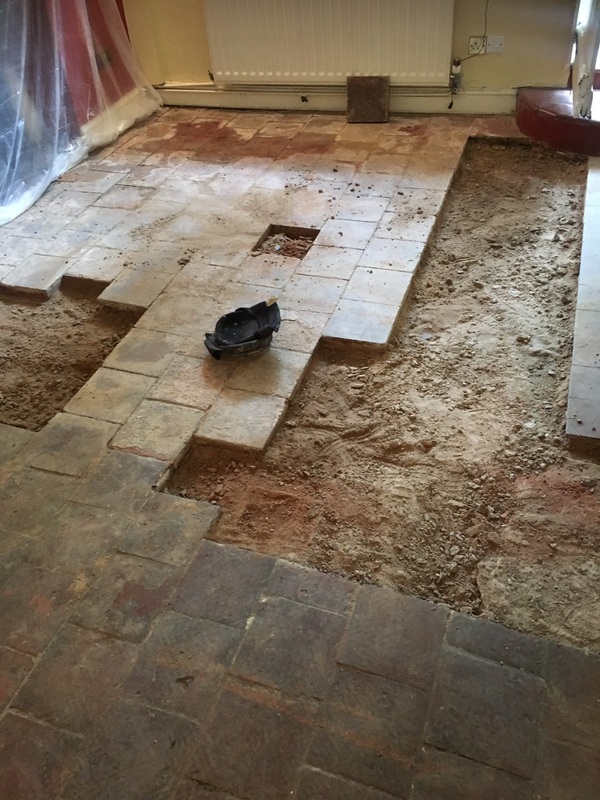 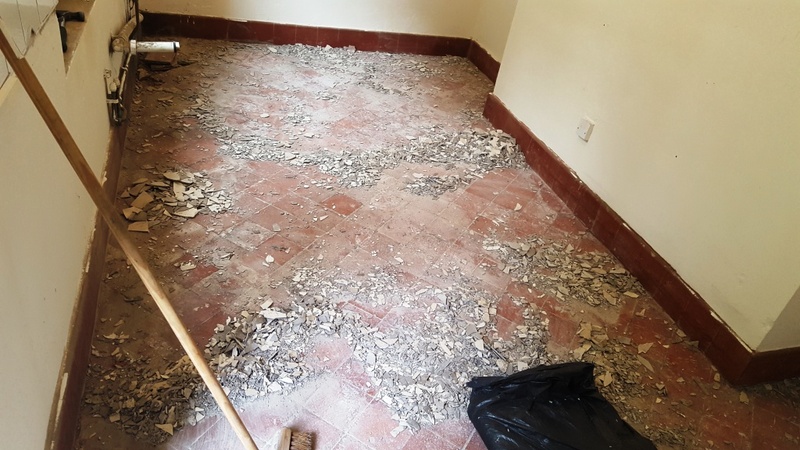 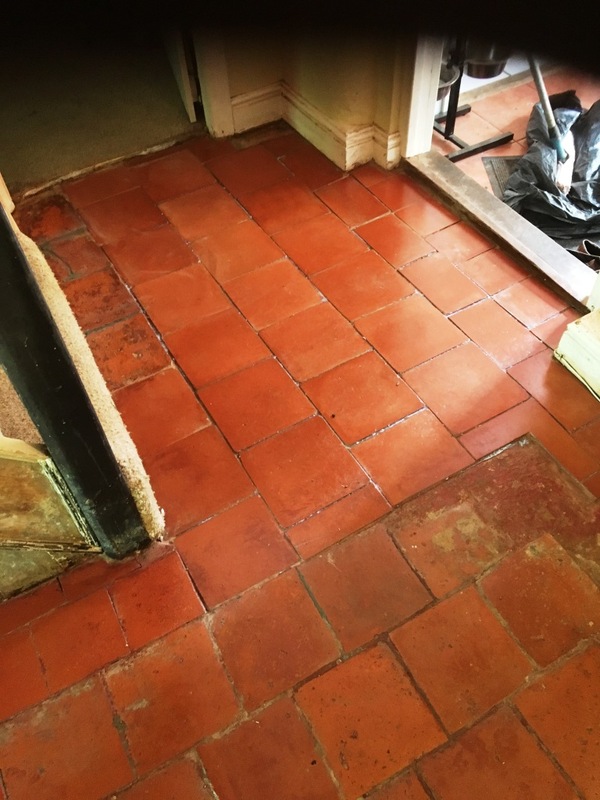 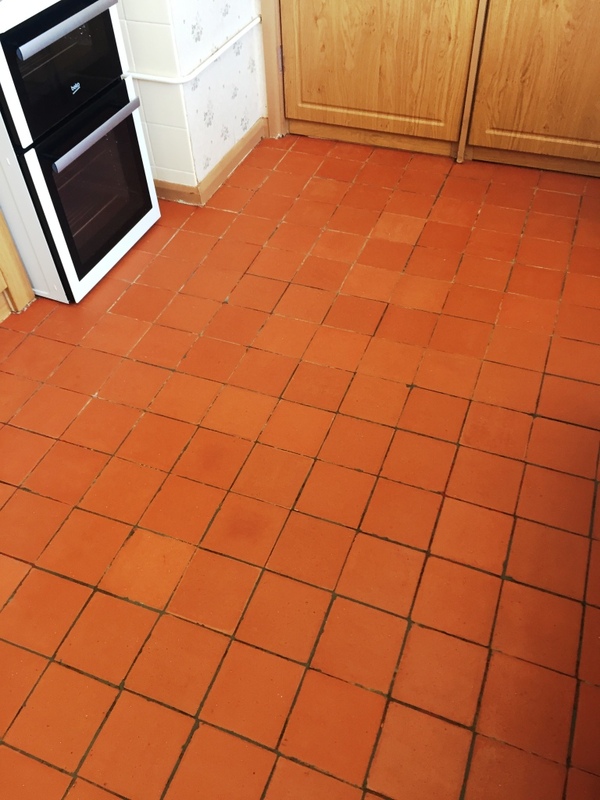 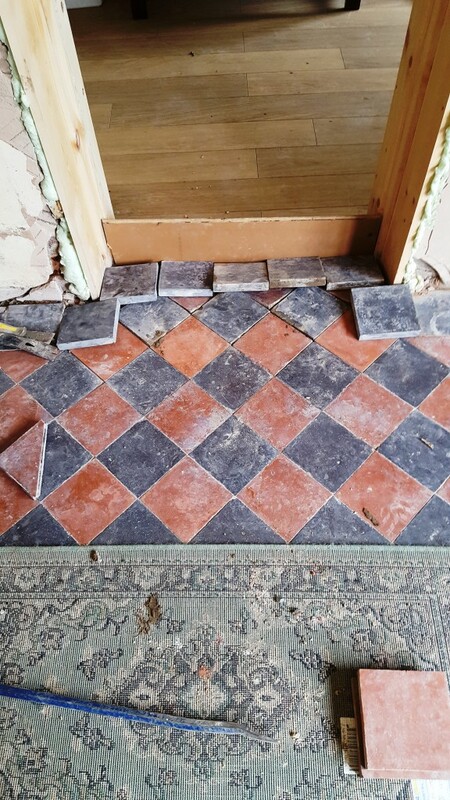 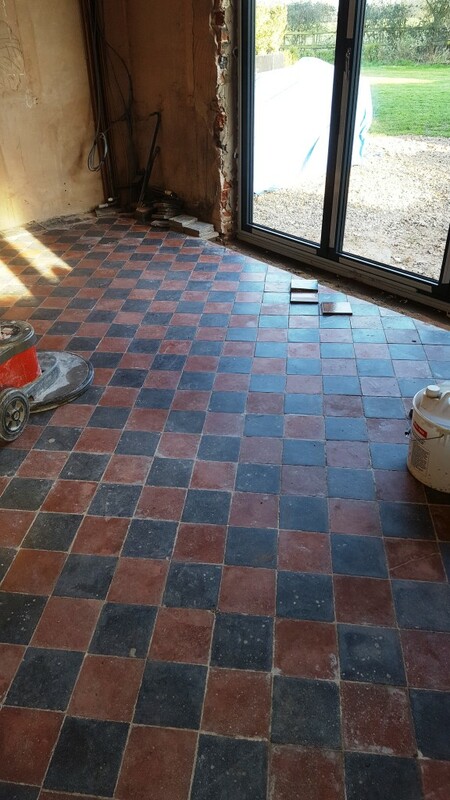 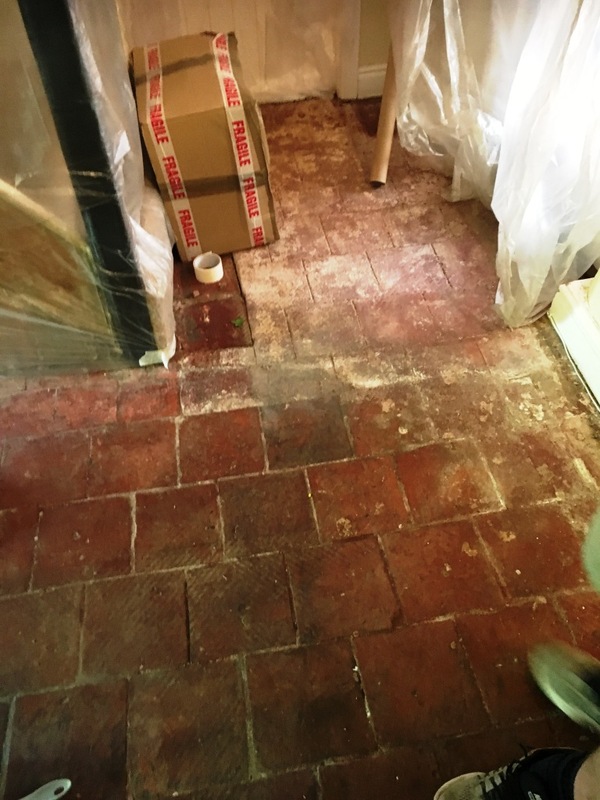 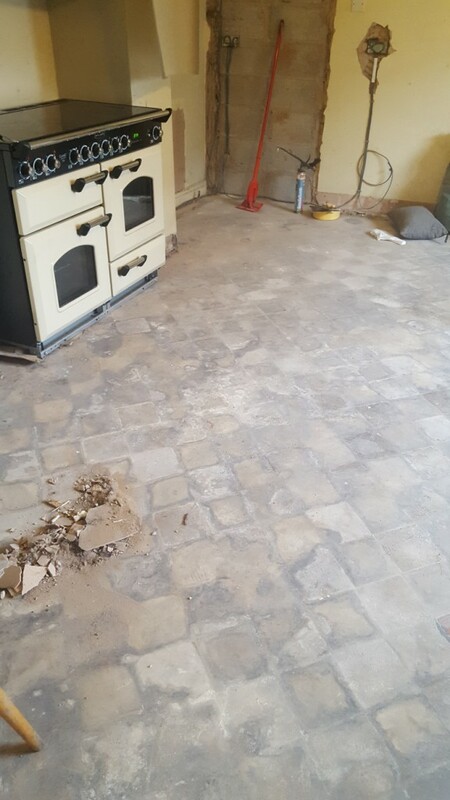 We were asked to take a look at restoring a Red and Black Quarry tiled kitchen floor that at some time in the past had been covered in a floor levelling screed. 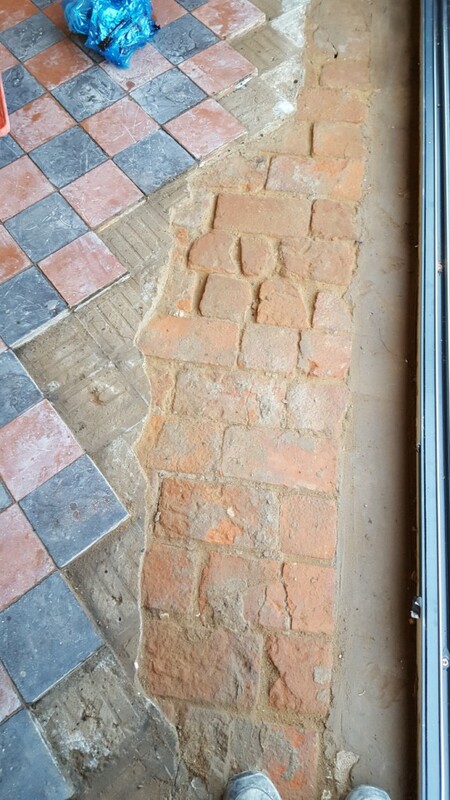 The house was in the old village of Mobberly on the East side of Cheshire and was undergoing significant renovation works. 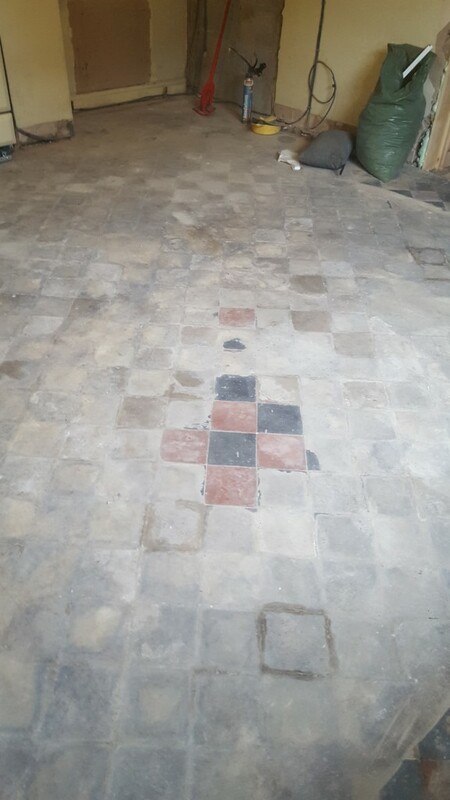 The compound was up to one inch thick in places and underneath the screen was a lovely red and black quarry tiled floor that was just about visible in the thinner parts of the screed. 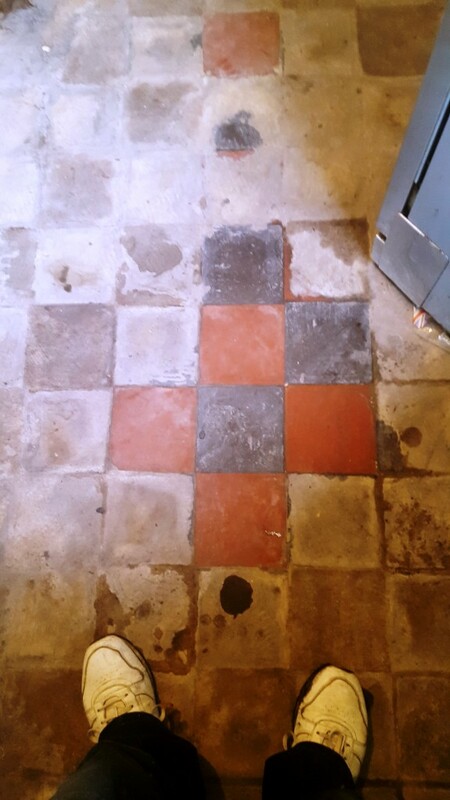 The owner was keen to understand if they could be restored. 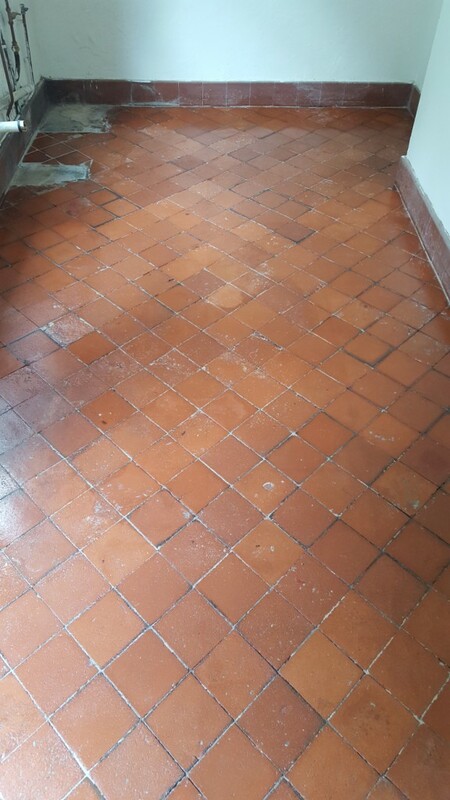 After inspecting the floor, I offered to do a test clean and given the state of the floor decided to tackle it with a strong batch of tile doctor remove and go mixed 50/50 with Tile Doctor HBU Remover. 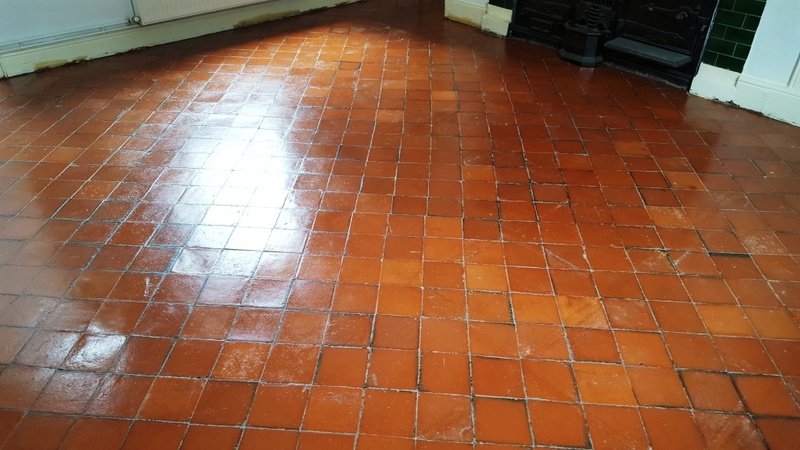 This was applied to the floor, left to soak for ten minutes and then scrubbed in. 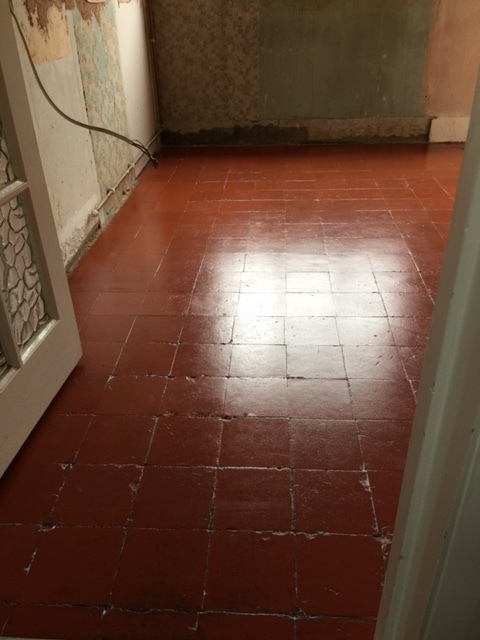 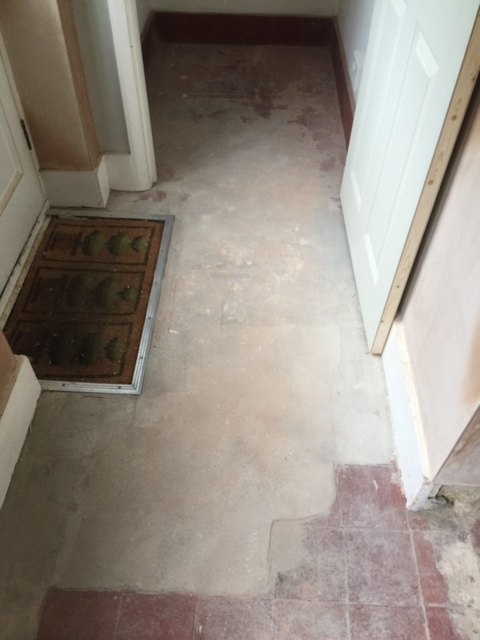 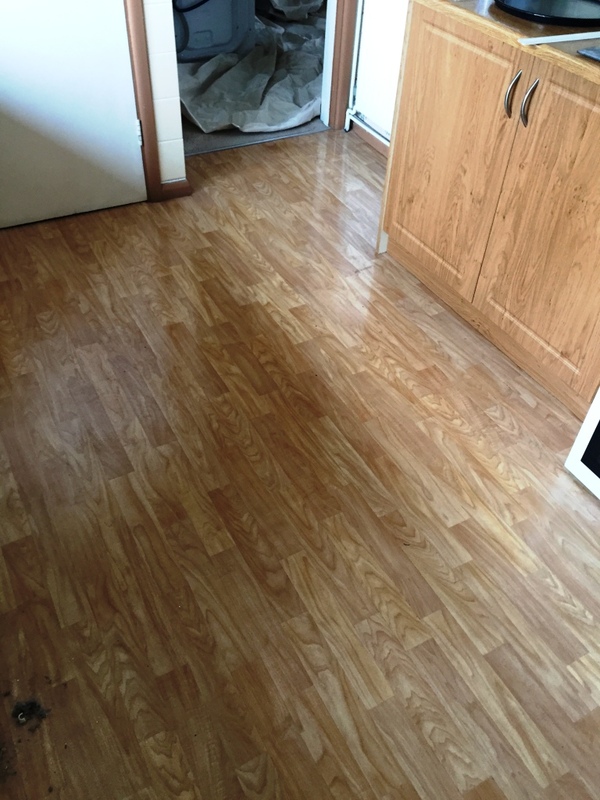 The process was successful and demonstrated the screed could be removed and tiles cleaned and so we were booked into to do the job a couple of weeks later. 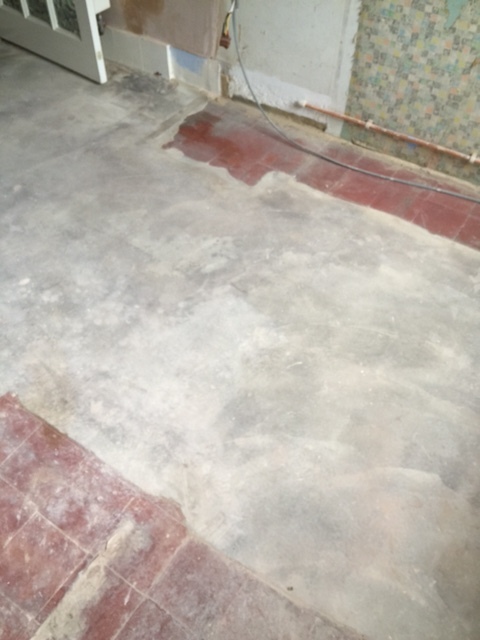 On our return to the property I took a couple of photographs before we began removing the screed. 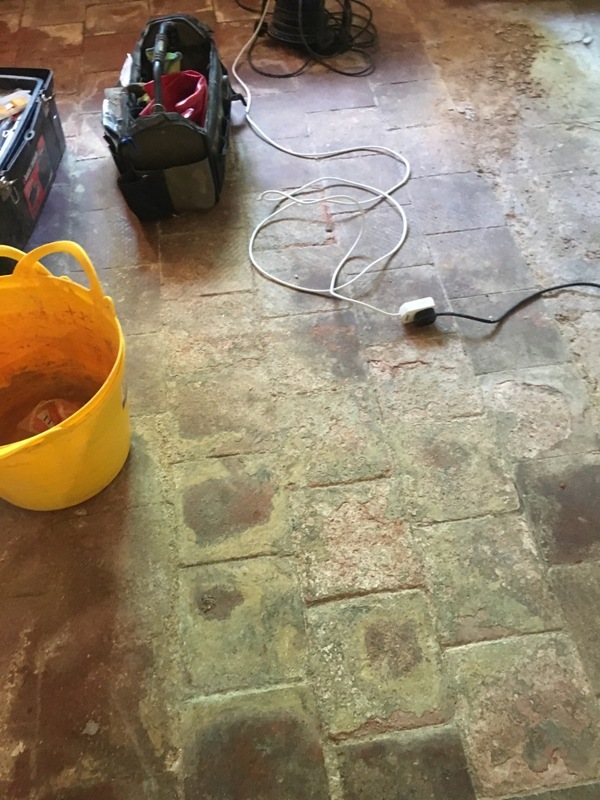 I then setup about removing the screed starting with the application of a fresh batch of Tile Doctor Remove and Go mixed 50:50 with HBU Remover. 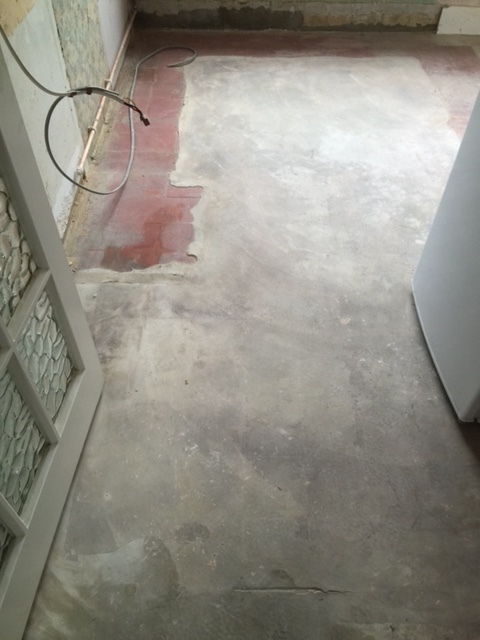 HBU stands for Heavy Build-Up and therefore just the thing for this floor. 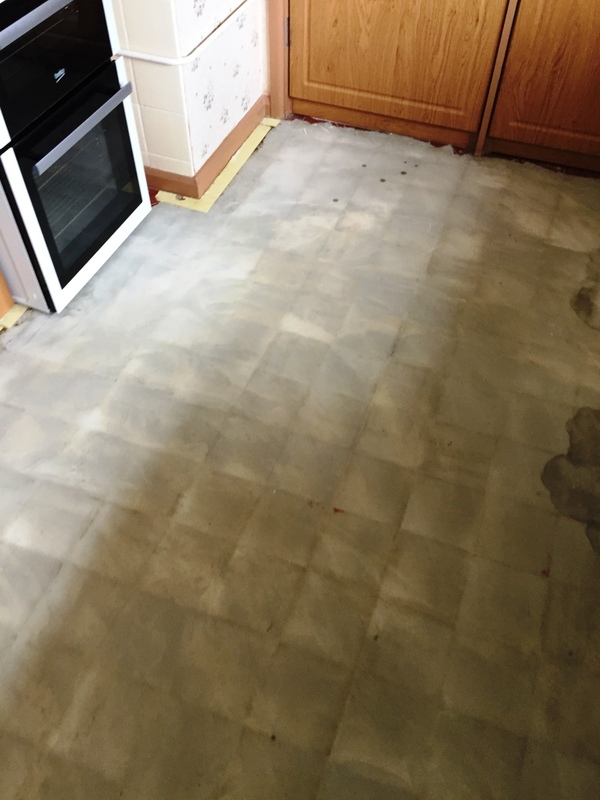 The solution was applied to the floor and left to soak in for some time. 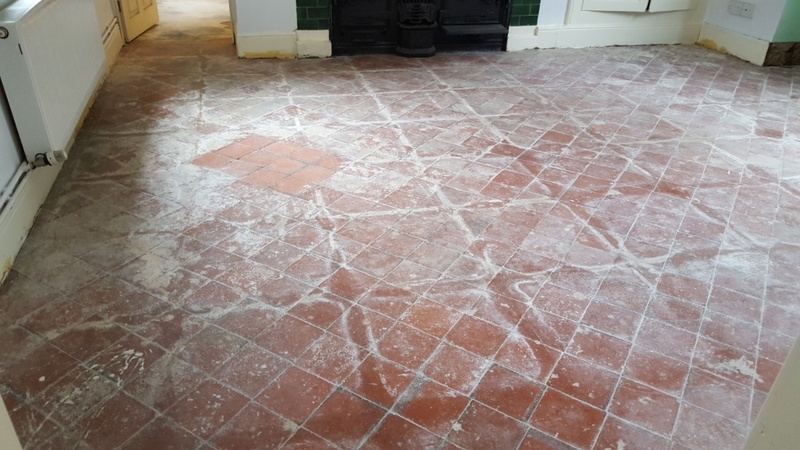 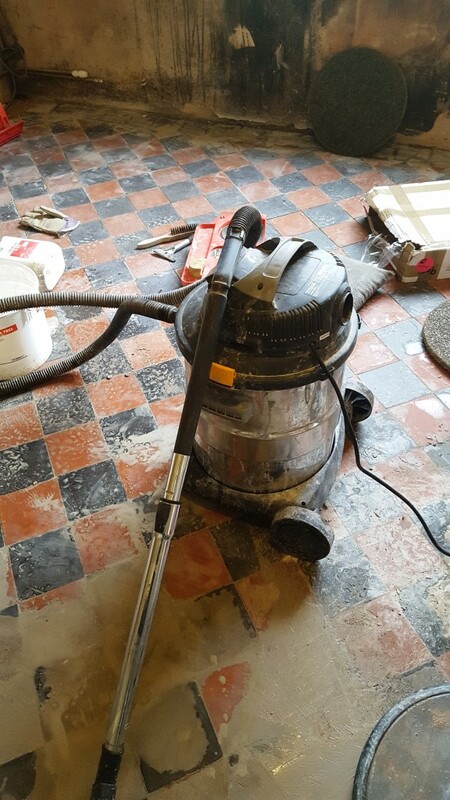 This had the action of softening the floor levelling screed and we were able to remove it using a combination of wallpaper steamer and scrapers taking care not to scratch the quarry tiles. 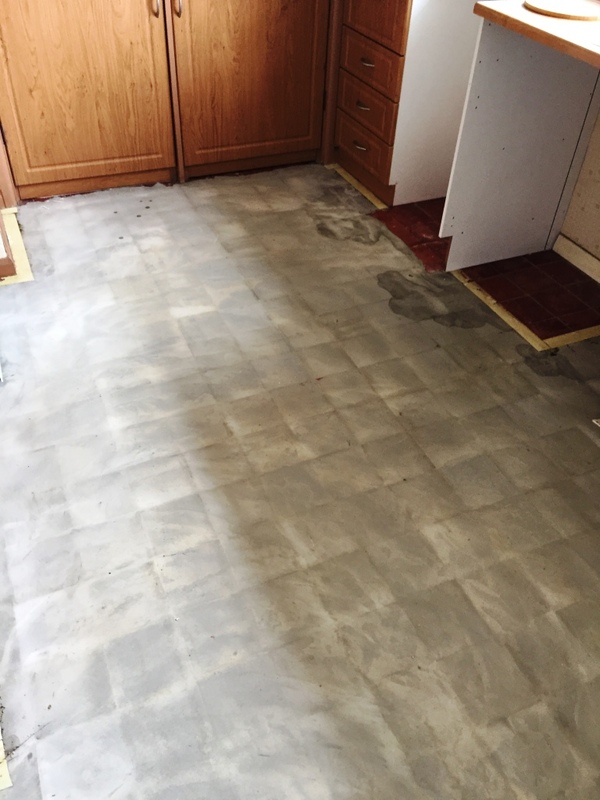 In some of the more stubborn areas the floor was covered in a plastic sheet and the solution left to sweat into the screed overnight to soften it further. 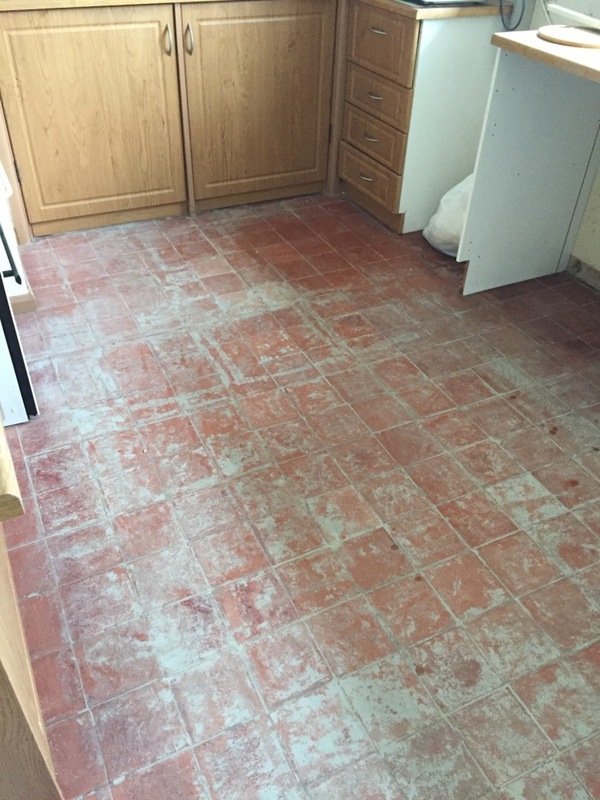 When all the screed was removed we washed the tile and grout down with Tile Doctor Pro-Clean worked in with a rotary buffing machine fitted with a black scrubbing pad. 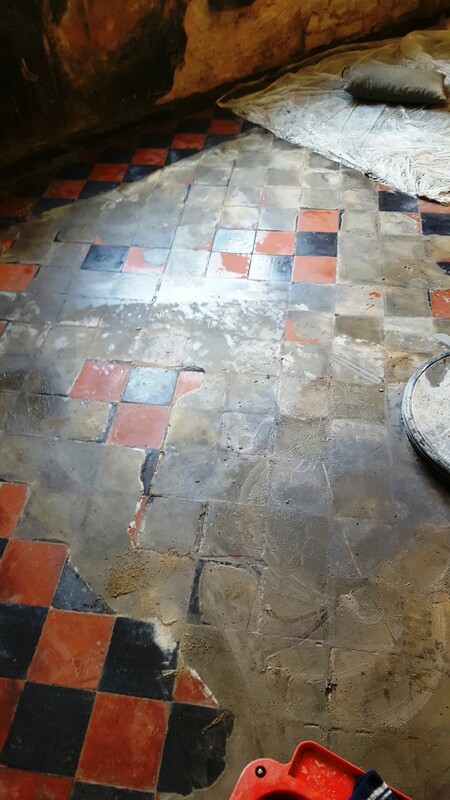 This brought out the ingrained dirt which was rinsed away with water and then extracted off the floor using a wet vacuum. 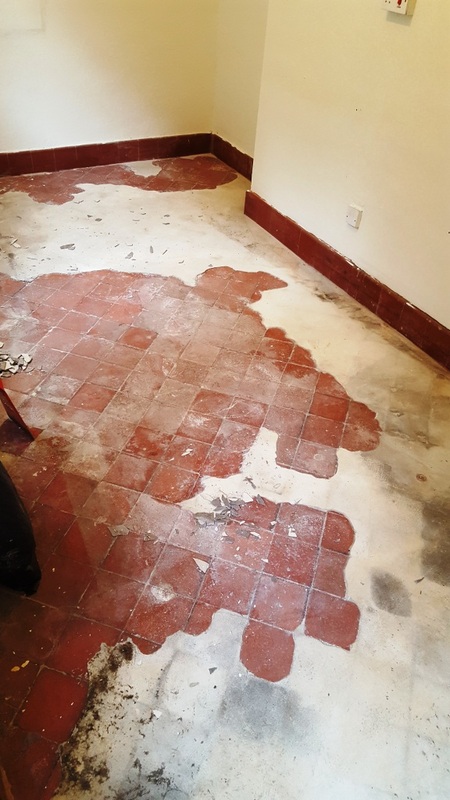 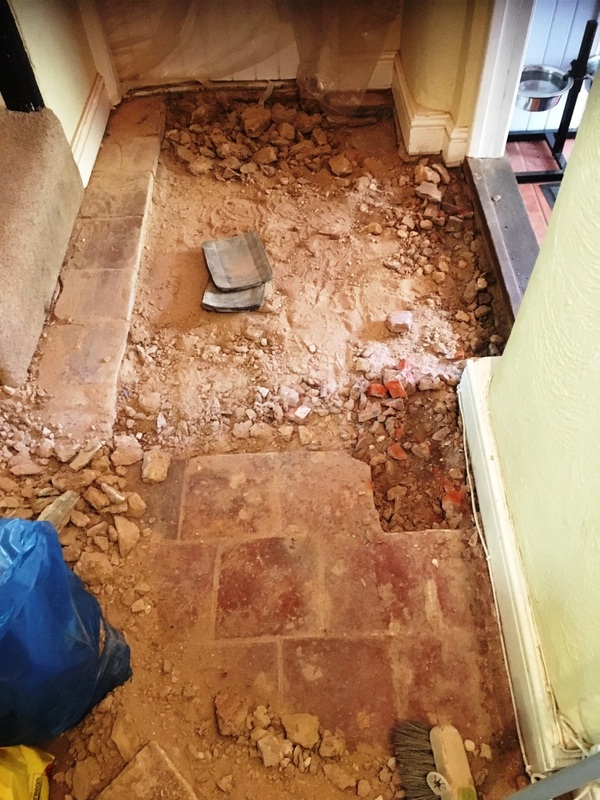 With the screed removed it revealed a couple of areas where the floor tiles had become lose and would need rebuilding, both areas were near doorways so I suspect past home improvement work had cause the tiles to lift. 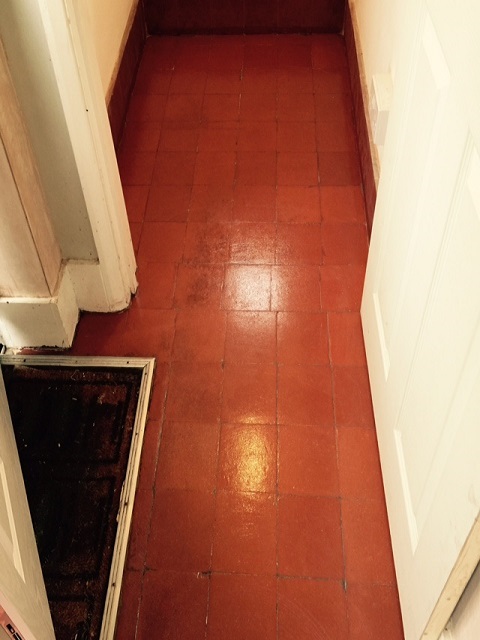 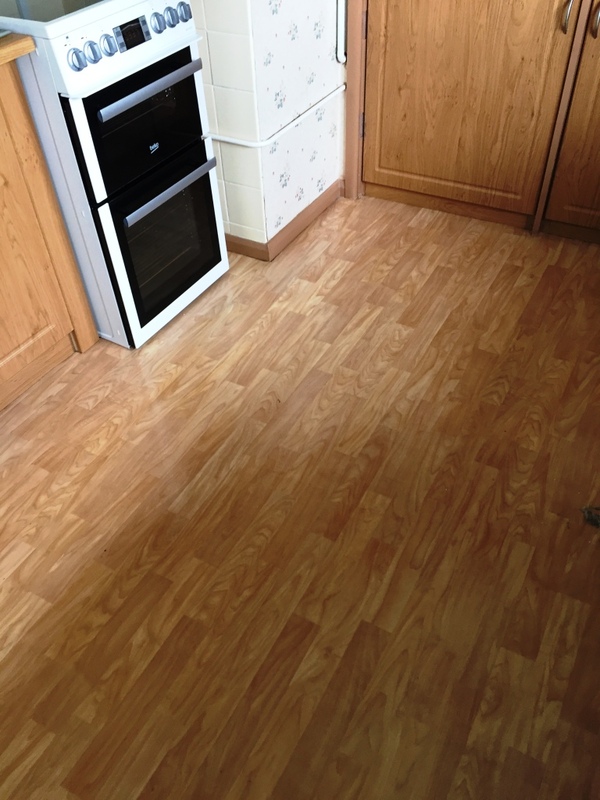 We were able to re-use all of the tiles and after rebuilding the subfloor they were laid and grouted in. 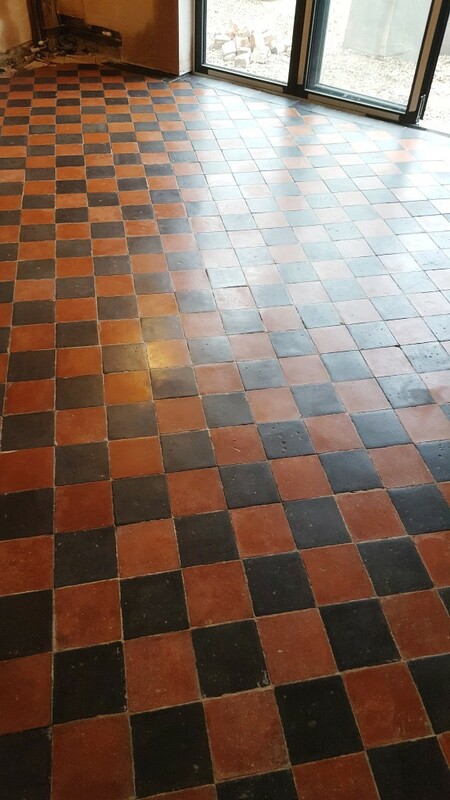 With the floor now clean and lose tiles re-laid the next day we moved onto to the final job of sealing the Quarry tiles. 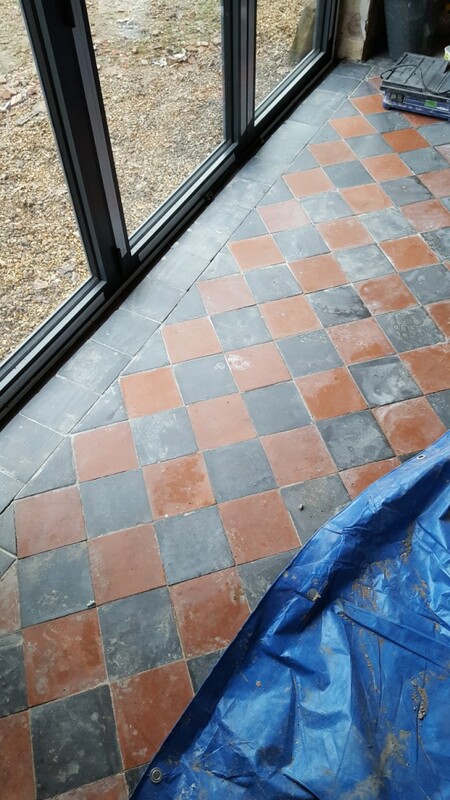 First checking to ensure the floor was dry we then proceeded to apply three coats of Tile Doctor Colour Grow which is an impregnating sealer that leaves a matt effect and brings out the colour in the tile. 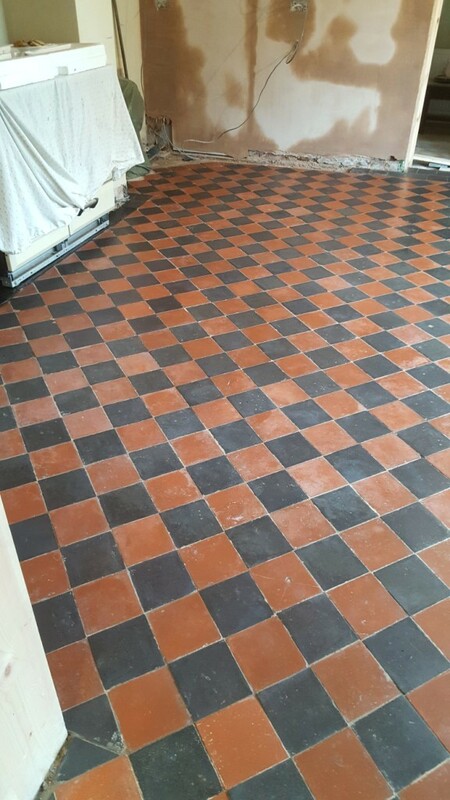 It was a long job spread over quite a few days but it was well worth the effort. 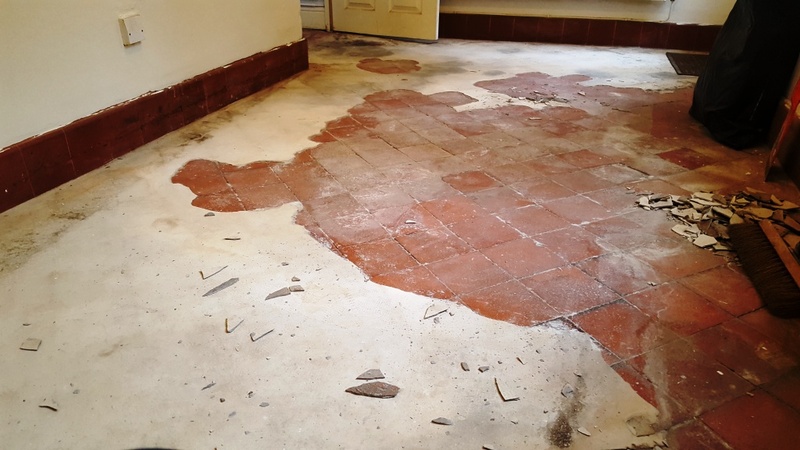 The costumer couldn’t believe the transformation that had taken place to the floor.